Selwood's new SelWatch technology is a remote Cloud-based telematics tool that offers real-time performance monitoring. 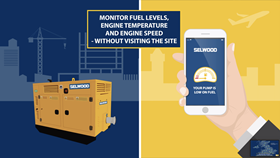 UK pump manufacturer, Selwood, has launched its new SelWatch technology, a remote Cloud-based telematics tool that offers real-time performance monitoring across its pump range. SelWatch provides users with 24-hour updates about GPS pump location, fuel levels and fuel consumption, engine efficiencies, site water levels and servicing status. The system has been designed over two years of research and development to enhance Selwood’s service to rental and sales customers. Mark Bebbington, technical solutions director at Selwood, said “Digitisation is increasingly important in the water handling and construction industries, where accurate, easily accessible real-time data can significantly reduce downtime and associated costs"
He added that SelWatch provides added value and visibility across its pump range and it will be offered as an optional extra on the pump solutions rental fleet throughout the company’s UK branch network and for sale through its international network of distributors.